Ukranian born French pianist who specialised in the works of Chopin. Photograph signed "In remembrance of A. Bronowsky. London. Nov. 1938". Alexander Brailowsky is shown half-length in profile, seated at his piano with a look of intense concentration on his face. Approx 9 x 7 inches (23 x 18 cms). In fine condition. 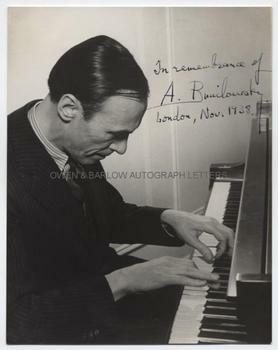 Alexander Brailowsky was in London during 1938, where he made many recordings for HMV.